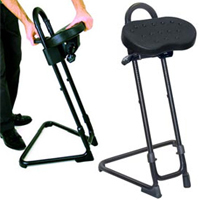 This sit-stand chair offers 10" of continuous height adjustment through the patent-pending Lyon Gravity Lock System, featuring postive locking at the set height. An innovative base allows the chair to be positioned wherever you need it. The chair is extremely stable with four strong nylon anti-slip glides which provide stability on most flooring. The ergonomically formed padded polyurethane seat tilts forward up to 20° and swivels 16° in either direction and automatically returns to the center when released. 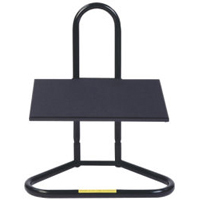 The matte black tubular steel base is durable and looks professional in industrial and office settings. The large 18" wide x 12" deep platform is fixed at a comfortable 10° angle. This footrest features an incredible height adjustment range of 3" above the floor to 16" above the floor. The textured rubber matting is slip-resistant, and this rest has a durable tubular steel design with matte-black finish. This unit provides easy and precise height and tilt adjustment for maximum support and comfort. The large 18" wide x 12" deep platform offers infinite tilt adjustment from 10° to 35°, and height adjustment from 3" to 16". 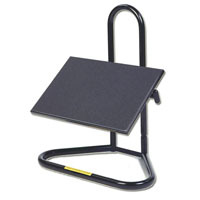 The textured rubber matting is slip-resistant, and this rest has a durable tubular steel design with matte-black finish.